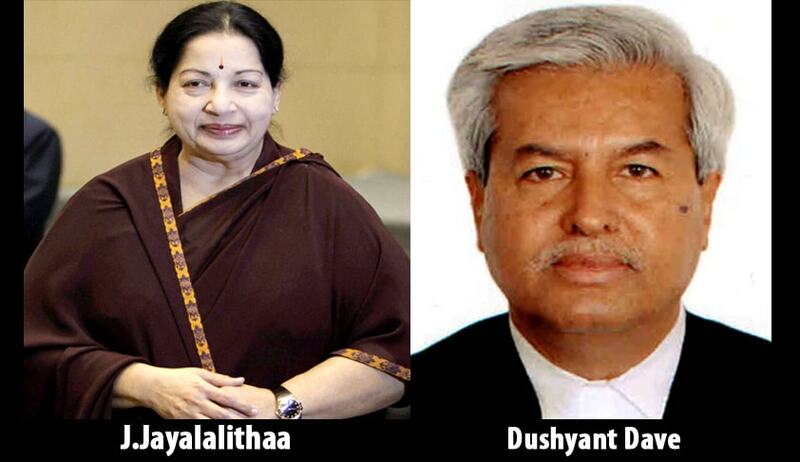 Karnataka Government has reportedly appointed Senior Advocate Dushyant Dave as its special prosecutor in the disproportionate assets case against Tamil Nadu Chief Minister J. Jayalalithaa, being heard by the Supreme Court. Mr. Dave will work alongside Karnataka's former Advocate-General and Special Public Prosecutor before the special court and the High Court B.V. Acharya. In the Petition filed before the Supreme Court, the Karnataka Government has contended that Jayalalithaa’s acquittal by the High Court was a ‘farce’. They have contended that the High Court had committed a mathematical error while calculating her income from her various ventures including agricultural income and the loan taken by her from nationalized banks. The High Court had held that Ms. Jayalalithaa’s disproportionate assets was around Rs2.82 crore against the prosecution claim of Rs 66.5 crore and acquitted her on the ground that it was less than 10 percent of the income and the offence was not made out. The Petition claims that if the calculation is undertaken without any errors, then the percentage of her disproportionate assets would be 34.50%, which was erroneously fixed at 8.12% by the court. Earlier in May, Ms. Jayalalithaa and three of her associates were acquitted in the Disproportionate Assets case by a single judge of the Karnataka High Court. Read the LiveLaw story here. She had returned to office as Chief Minister in May after she was acquitted. The Trial Court had convicted and sentenced Jayalalithaa and her 3 associates to four years in prison besides imposing a fine of Rs 100 crore on September 27 last year.